Long before I was a Celtics fan, I was anti Lakers. The reasoning was simple enough. My dad was a Celtics fan and I was taught that under no circumstances was it ok to align with the Lakers, so I didn’t. This was the mid 1990’s in a small country town in Australia, so the access to the NBA isn’t what I could have if I was living in the same situation today. I had no reason to support a particular team, and to be honest, with the lack of coverage, my interest in the NBA never really spiked beyond video games, where I always found myself drifting towards the Warriors, Celtics or T-Wolves. 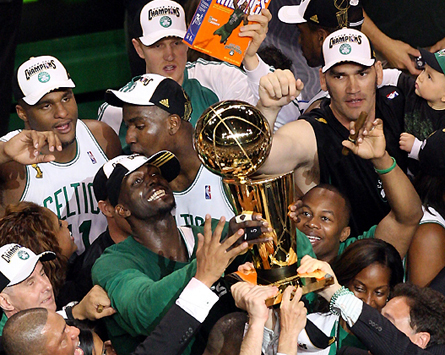 I can’t remember exactly when it happened, but the decision to become a Celtics fan was easy. The franchise have a great history, play in a wonderful city (which I already loved because of my love for the Red Sox) and the rivalry with the Lakers was something which captivated me. The Friday night game against the Lakers was exciting for a number of reasons – Rondo was coming back, the team have shown positive signs despite not getting the results to go with it, and it’s the Lakers visiting the Garden, which is always special. Simply put, we should have won on Friday – The game was ours for the taking and we blew it with some terrible decisions in the final quarter (not the first or the last time that will happen this year, that’s for sure). For once I don’t see a loss to the Lakers as the most frustrating thing we could suffer through. Simply put the Lakers aren’t going to win a banner this year, which means the Celtics still have the most banners in the history of the NBA. Narrow-minded view? You know it. But having the most titles in the history of the league is something we should be proud of. While banner 18 might be a few years away we should celebrate the fact that the men from the West Coast won’t be raising their seventeenth any time soon.